1) A hot glue gun with many glue sticks. 2) 4-6 felt sheets (8 1/2'' X 11'') That you can find at your local craft store (Dollar store). 3) A pair of scissor. 4) You need approximately 30 feet (varies with each frame so buy more than you need) of shinny ribbons of your choice. Photo #3: You need to cut down the felt sheet in 1/2 inch strips. Photo #5: Before your start gluing your felt strips, you need to stretch them to a 1/4 inch width. Apply your felt strip on the wire and put your first drop of glue (Remember to put very little glue). As you start wrapping the wire with the felt strip, make sure to put enought tension on the strip to keep it as narrow as possible. Apply glue after 3-4 turns. Enought tension and minimum glue will avoid the wire to get too big. Keeping your felt strips about 12 inchs or less will gladly improve the making. Photo #6: You can choose to overlap your felt strips to add some volume to the wire or keep it side to side. Photo #7: You can start by cutting the ribbon's end in a 45 degree angle. Repeat the same technique previously done with the felt strips. Please take note to keep the hot glue to a MINIMUM because it will show through the ribbons and always keep a steady tension. You need to overlap the ribbons at least to a minimum to hide the felt strips. Photo #8: Decorate the backpack frame completly but keep the round part for step #12. Photo #9: This step demands you to insert the round part into the tubular pieces. When the wire is completly inserted, mark it because you must not decorate the wire in the tubular piece. Photo #11: Step 11 show you exactly where to stop your felt and ribbon wrapping. Photo #12: To wrap the rounded part (feather holder), put a complete felt sheet on the table. Take the round part and put it on a uncutted felt sheet and make sure the undecorated wire that goes in the tubular pieces are in the air. Photo #13: Cut it along the wire leaving 1/2 inch felt to fold it back. Photo #14: For this step, be sure to glue and fold about 1/2 inch at the time. We will not see this step in the end so don't waist your time here. Photo #15: Here is a better view of what it should look like. Photo #16: You should end up with this result. Photo #17: Here is another view from the back. Photo #18: It all depends with what you'll be decorating your frame with but i reccommend the fast setting epoxy glue for rhinestones and you can use the hot glue for sequins and stones, etc. I recommend THECRAFSOUTLET on Ebay for your Rhinestones! Photo #19: Please mix the epoxy equaly and well! I cutted the tip of a toothpick to make it flat to apply my epoxy glue. Great tool!!! Photo #20: Put decorations everywhere you want. Photo #21: Here's another view of the work in progress. Photo #22: Now you need to put the backpack in this position on the floor. Photo #23: For this next step i simply putted 30 feathers on the floor to have a first view of what i am looking for in the end. Be careful with the ostrich feathers natural curves. 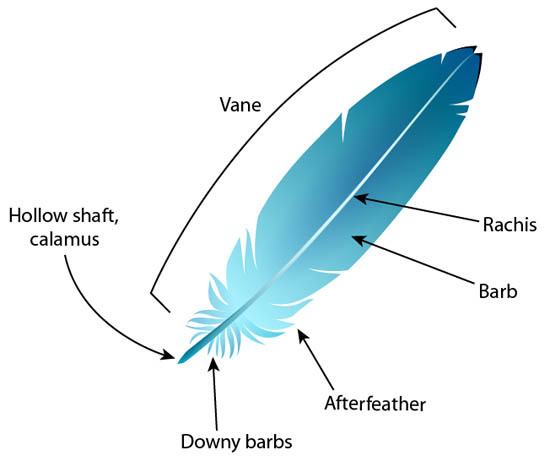 If you use 30 feathers, you must have some straight feathers, some with a curve to the left and some with a curve to the right. When you buy your feathers take the time to choose them. Photo #25: You need to cut the extra calamus or quill on the first feather you will apply. I recommend crushing the quill lightly about 2 inches for a flat fit and this will help you with the gluing part.without forgetting the shape of your backpack. Photo #26: With the backpack still on the floor, you are standing above it and this will help you to put your first straight feather square on the backpack. Using ceramic tiles as a guide, it will help you alot. Photo #27: As you apply the other feathers, please note to glue or to cut the downy barbs very close to the quill. This will leave you all the space required to glue the other feathers real close to one another. Photo #28: As you install your feathers, you can choose to glue them in a round, oval, butterfly or any shape you desire. PLEASE NOTE to avoid hiding your lower back and bottom (buns) because it will ruin the look. Feathers are meant to heighten a woman’s silhouette, not cover it! Photo #29: After you have traced the round part on the felt, cut it following the line. Photo #30: You can glue that felt piece on the round part frame. This will be covered in the end so cut the extra felt if not centered or don't worry if it's too narrow. Photo #31: We decided to add an applique to the back so there was no need to decorate it. You can always decorate the felt with feathers cutted in half to recreate the backpack shape or simply use a boa. Be original, it pays in the end! Photo #32: I made this original design to finish the backpack decoration and you can do the same at home even if you can't weld because this piece will not hold any weight! All you need is a pair of pliers, 14 gauge wire and a good idea for your own desing! Photo #33: This is exactly the same technique as described at step #5. Photo #34: Decorate every piece of wire that will not be hidden by an apllique or feathers. Photo #35: This step will need you to make 2 identical pieces. There is no need to leave an edge here so trace them flush to the wire. Photo #36: Cut along the line you have just traced. Photo #37: Don't forget to put a minimum of glue because it will show through the ribbon! I advise you that if you have TV promo, everyone will be able to see the glue on their HD TV!!!!! Photo #38: Like we told you in step #7, overlap the ribbons at least a minimum to hide the felt. KEEP GLUE TO A MINIMUM! Photo #39: You can glue the felt center piece like in step #14. This side will be filled with glue and be fixed to the backpack. Photo #41: This is a part of the applique i chose to put on my backpack. You can easely find this on ebay. Photo #42: This is the other part of my applique. They were too long so i cutted them to make them fit even better. Photo #43: We are now back at gluing rhinestones! If you want to shape the wire a little bit, the stones will hold but be careful not to curve the wire too much. Photo #44: Here's an example of curved wire that you can make. If you decide to make even more pronounced curves, i advise you to put the rhinestones after bending the wire in it's final shape. I suggest to make curves because a wire that is suppose to be straight and isn't looks BAD! Photo #45: This is what it looks like before gluing it on the backpack. Photo #47: We added some decoration to the backing to enhance it even more. Photo #48: You can and surely will add gems or flat rhinestones to the rachis but be cautious with their size! Start with larger rhinestones at the bottom but go smaller as you move up the feathers!!! You don't want to lose the natural bouncing movement of the feathers!!! This is IMPORTANT!!! Photo #49: We have applied an black elastic to the eyelets under the armpits to show you but choose an elastic that matched the colour of your skin! Remember that every little flaw that the audience sees is not good. Think perfection! Photo #50: The round part behind the head was not covered in the beginning but after only one show, we could see the felt material behind the head even if her hair was hiding almost everything and even while dancing. Alexandra also mentionned me that she wanted to hide the frame so we added a marabou to the lower frame and it was a success! The picture says it all. Photo #51: The final product from the back. Photo #52: Alexandra was extatic when she saw this picture and this is how you should feel about your costume!!! THANK YOU VERY MUCH FOR VIEWING AND READING!!! Le TOUT PREMIER vidéo sur comment faire votre coiffe de samba! 2) From 3-5 felt sheets (8 1/2'' X 11'') That you can find at your local craft store (Dollar store). 4) You need approximately 30 feet (varies with the headdress) of shinny ribbons of your choice. Photo #5: Before your start gluing your felt strips, you need to stretch them to a 1/4 inch width. Apply your felt strip on the wire and put your first drop of glue (Remember to put very little glue). As you start wrapping the wire with the felt strip, make sure to put enought tension on the strip to keep it as narrow as possible. Apply glue after 3-4 turns. Enought tension and minimum glue will avoid the wire to get too big. Photo #6: Keeping your felt strips about 12 inchs or less will gladly improve the making. Photo #7: You can choose to overlap your felt strips to add some volume to the wire or keep it side to side. Photo #8: You can start by cutting the ribbon's end in a 45 degree angle. Repeat the same technique previously done with the felt strips. Photo #9: Please take note to keep the hot glue to a MINIMUM because it will show through the ribbons and always keep a steady tension. You need to overlap the ribbons at least to a minimum to hide the felt strips. Photo #10: It doesn't matter where you start or finish but keep in mind to always put the joint on the skin side. Again, we must never see a glue bumps showing or ribbon's joints. Photo #11: This is only to show you that you can fill any space that you want by gluing a felt piece on the felt strip already applied and cut along the felt strips to keep the edges as invisible as possible. Photo #12: Now that the front part is done, continue with the felt and ribbons until all the frame is wrapped. No need to wrap the upper rounded part. Photo #13: To wrap this upper head piece, put a complete felt sheet on the edge of the table. Take the frame in your hands with the forehead looking down at the floor and glue it on. Photo #14: Here is a better view and keep the glue to a minimum and inside the upper head piece. Photo #15: Cut it along the wire leaving 1/2 inch felt to fold it back. Photo #16: For this step, be sure to glue and fold about 1/2 inch at the time. We will not see this step in the end so don't waist your time here. Photo #17: You should end up with this result. Photo #18: This is the materials i needed for this step. It all depends of what you will be decorating your frame with but i reccomend the fast setting epoxy glue for rhinestones and you can use the hot glue for sequin and big stones, etc. Photo #19: I cutted the tip of a toothpick to make it flat to apply my epoxy glue. Great tool!!! Photo #22: Now you need to put the headdress in this position on the floor. Photo #23: For this next step i simply putted 13 feathers on the floor to have a first view of what i am looking for in the end. Photo #24: Be careful with the ostrich feathers natural curves. If you used 13 you must have 1 straight feather, 6 left curved and 6 right curved. When you buy your feathers take the time to choose them. Buy your feathers in a odd number. Photo #26: I reccomend crushing the quill lightly about 2 inches for a flat fit and this will help you with the gluing part. Photo #27: The hot glue gun is my weapon of choice to fix feathers. Photo #28: The headpiece is still on the floor, you are standing above it and this will help you to put your first straight feather square on the headpiece. Using ceramic tiles as a guide, it will help you alot. You can fix the feather about 2 inches from the head but you can also put them higher if you want. Photo #29: Put your second feather next to the other but don't cut the extra quill right now. Photo #30: This step is important. Normally, you want to end up with a mix of oval and round shape so you need to align the feather tips for the shape your are looking for. Photo #31: As you apply the other feathers, please note to glue the downy barbs very close to the quill. This will leave you all the space required to glue the other feathers real close to one another. Photo #32: Even if we don't see this step in the end, it will help you to follow the headdress shape as you cut and glue the feathers. Photo #33: As you are installing the last feathers, make sure to cut the extra downy barbs. Photo #34: This is what it should look like. Photo #35: This is the applique i chose to put on my headdress. You can easely find this on ebay. Photo #36: I also glued on my applique. There is no need to put alot of hot glue as you might need to change a feather one day. Photo #37: This is a great size for an applique but you can go a little bigger. Photo #38: As you can see i have modified the applique. Feel free to cut your applique in strategic places as this will give you more of a custom look. Photo #39: You can also apply small rhinestones on the Rachis if you want. Photo #40: Putting the rhinestones on both sides in the same time it's a good idea. Start at bottom going up and expend the design like you want. Photo #41: As you can see, i did not apply rhinestones too far up the feathers because it will add weight and eliminate natural movement. Photo #42: This picture is to convince you that you can trim ostrich feathers even if you persuaded that you bought the biggest one on earth at the smallest price!!! Photo #43: This picture is to show you that i have trimmed some afterfeather because they were hiding the top of my applique. Be careful on trimming because there is no comming back if you cut too much. Photo #44: For the headdress backing, i cutted a felt sheet to the shape of the upper head part to apply a very basic feather decoration. You can do the same or simply apply feathers, stones or a boa to enhance the backing. Be creative!!! Photo #45: I find it easier to put the decorations on the felt sheet than directly on the headdress. Photo #46: Again, this is an example of what you can glue on the backing. I kept it simple for the ''HOW TO'' video but i beleive that the backing deserve some good taste also. So many people forget about the backing. Photo #47: After i was satisfy with the backing decoration, i glued it on the headdress with hot glue. Don't put too much glue! Photo #48: Even if Johnny Cool's headdresses offer a great maintain and eyelets on the back, you need to secure it in place with a good quality elastic band. I chose to put a black 1/2 inch elastic band since i have dark hair. Photo #49: This picture demonstrate why i mentioned not to put too much glue on the backing. I took the backing off and i decided to add 8 feathers to the headdress to add more depth. A minimum of 13 feathers is required for this style or you can go up around 21, more or less. MERCI BEAUCOUP BON VISIONNEMENT ET BONNE LECTURE!!! Comment faire un BACKPACK de samba? Comment faire une COIFFE de samba?